“I wanted to draw your attention to our production of Paolo Bacigalupi’s THE WINDUP GIRL, which just went in the store this week. Every review of this book is a rave – and it’s being called one of the best if not THE best SF books of the year. 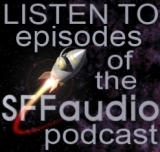 Our production is especially great since it’s narrated by Jonathan Davis; you might recall that his narration of Robert J. Sawyer’s CALCULATING GOD won the 2009 Audie Award for Sci-Fi. Cool! Davis is also the narrator for the praiseworthy “Starship” series by Mike Resnick! Anderson Lake is a company man, AgriGen’s Calorie Man in Thailand. Under cover as a factory manager, Anderson combs Bangkok’s street markets in search of foodstuffs thought to be extinct, hoping to reap the bounty of history’s lost calories. There, he encounters Emiko…Emiko is the Windup Girl, a strange and beautiful creature. One of the New People, Emiko is not human; instead, she is an engineered being, creche-grown and programmed to satisfy the decadent whims of a Kyoto businessman, but now abandoned to the streets of Bangkok. Regarded as soulless beings by some, devils by others, New People are slaves, soldiers, and toys of the rich in a chilling near future in which calorie companies rule the world, the oil age has passed, and the side effects of bio-engineered plagues run rampant across the globe. What happens when calories become currency? What happens when bio-terrorism becomes a tool for corporate profits, when said bio-terrorism’s genetic drift forces mankind to the cusp of post-human evolution? 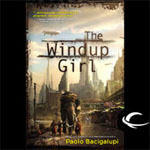 In The Windup Girl, award-winning author Paolo Bacigalupi returns to the world of The Calorie Man (Theodore Sturgeon Memorial Award-winner, Hugo Award nominee, 2006) and Yellow Card Man (Hugo Award nominee, 2007) in order to address these poignant questions. The novel’s title seemed familiar, so I looked on my bookshelf and spotted Infinivox’s The Fluted Girl by Paolo Bacigalupi (it’s also available via Audible.com).